1. The Russian election system has been transformed into a farce. Key components of the democratic election system are missing: an independent mass media, independent financing and independent courts. The YABLOKO party has been robbed of its lawful representation in the State Duma, and we shall contest in court the official results of the elections of December 7, 2003. In the present situation we adopted, as is already well-known, a decision not to propose a YABLOKO candidate for the presidential elections, as we have no intention of participating in another political imitation [of elections]. 2. We don't support the candidacy of Vladimir Putin for RF President. We believe that no steps were taken over the past four years to extricate the country from the deadlock oligarchic quasi-capitalism or resolve the key problems in education, security and the armed forces. The socio-demographic characteristics of the country have been continuously deteriorating. The arbitrary rule of the authorities and police has intensified and aspects of totalitarianism have been revived in Russia. The fake fight with the oligarchy has led to increasing authoritarian trends demonstrated by the executive authorities and the potential creation of omnipotent oligarchic rule by bureaucracy and the law and enforcement agencies in the country. The present developments are such that the YABLOKO party should not participate in the presidential elections. It is impossible to conduct an independent and free election campaign today. The political opposition can participate in the elections only provided three mandatory and necessary conditions are observed. The first condition: independent juridical system where you can seek justice: in particular this also concerns the development of the election campaign and counting of the votes. The second condition: independent mass media, which will transmit your point of view to the public. The third condition: independent sources of [parties'] financing. Otherwise we cannot speak about elections as such. Today a presidential candidate cannot obtain either financing or appear on TV or win a legal suit without the permission of the Presidential Administration. 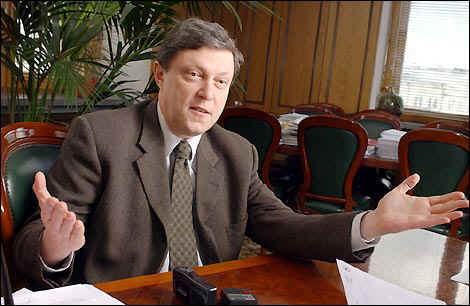 Certainly, one can become a decorative candidate and get a certain amount of money, obtain permission to appear on TV and collect signatures [in his support], as well as administrative resource for this, which will be "drawn" in the corresponding place: But we cannot be a decoration, we cannot insult the party and millions of voters. A negative and tough reaction will follow our decision not to participate in the presidential elections, as thus we are impeding the rapid development of the Potyomkin village in Russia.